The episode will air Sunday at 9 PM ET, or after the AFC Championship Game, on CBS. For networks, the post-Super Bowl time slot is a valuable opportunity to bring in lots of viewers for either a new show or to bring in potential new viewers for a show that’s currently running and give that show a viewership boost. While the Super Bowl is the most viewed event of the year, the conference championship games typically bring in tens of millions of viewers as well, providing a terrific primetime lead-in for the network showing the second game. That is what CBS is doing after the Patriots-Chiefs AFC Championship Game with a special episode of Magnum P.I. Magnum P.I. is a reboot of the 1980s series where Tom Selleck played a security expert and private investigator living in Hawaii. 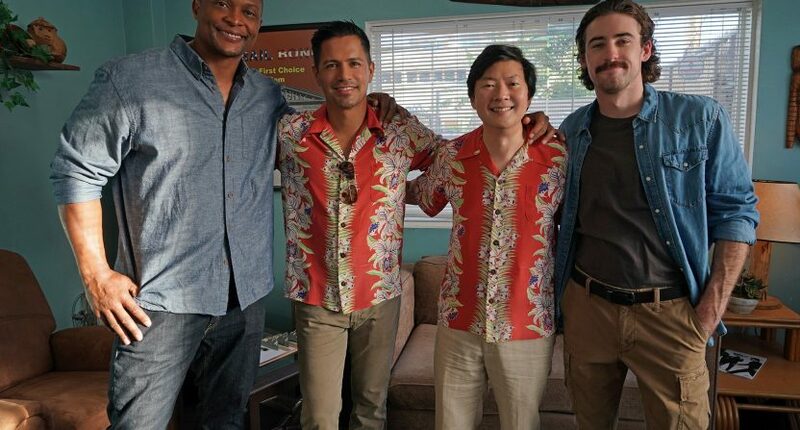 In the 2018 version, Jay Hernandez plays the titular Thomas Magnum which kept many of the same characteristics as the original (including the Ferrari), in addition to Magnum now being a Navy Seal who served in Afghanistan. NASCAR driver Ryan Blaney and former running back Eddie George will guest star in the episode set to premiere right after Sunday’s AFC Championship Game (9 PM ET, normally shown Monday at 9) on CBS. Blaney, who has a mustache that could rival Selleck’s, plays bounty hunter Shane Powell. George plays Travis Leet, who runs the bail bond shop and brought in the best bounty hunters and private investigators on the island to find a dangerous fugitive who skipped bail. While both athletes are more well known for their respective sports, both Blaney and George have taken to acting and have been doing quite well for themselves. Now that he’s been retired, George has been able to do more and has appeared in various shows and movies since 2004, including playing himself in Ballers and having a recurring role in NCIS: Los Angeles. George was also on Broadway in 2016, playing Billy Flynn in Chicago. Blaney is a rising NASCAR star and one of the most popular drivers in the sport. And while his time is rather limited during the NASCAR season, he finds opportunities to do fun things like acting off the track whenever he can. He lent his voice in Cars 3, appeared in Logan Lucky, and was a special agent in the TV version of Taken. Along with his weekly podcast Glass Case of Emotion where he and his co-stars discuss anything and everything, Blaney is a huge Star Wars and superhero movie aficionado who wouldn’t mind having a cameo in a future Star Wars movie. As long as Ryan keeps building his acting resumé, he may be fielding calls from Disney about that in the future.